Bespoke catalogue design and print experts, Andrew Burdett Design have produced thousands of catalogues. Our clients range from sole traders to famous international brands. From 12 pages to 1000+ pages, we have the expertise to produce your catalogue at very competitive rates. 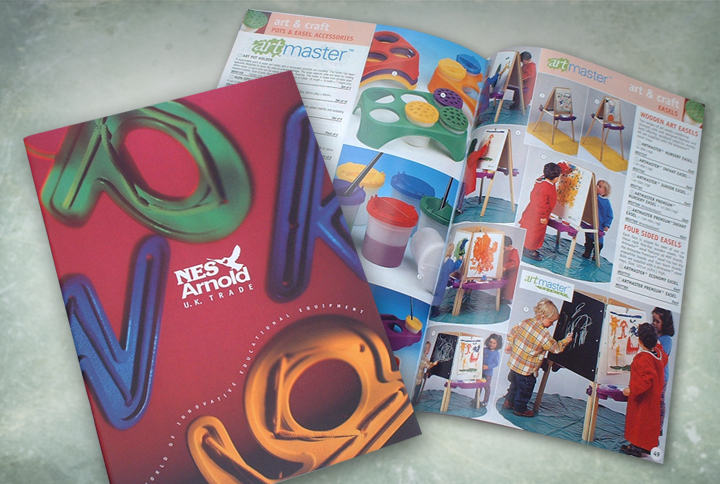 Pictured above is an example of a bespoke catalogue we designed and produced for NES Arnolds trade division. They wanted to show case their own developed and manufactured product ranges to education suppliers and to accomplish this they needed catalogue that would stand out from the crowd. In a saturated market we commissioned some unique, creative photography or the cover and added a special matt laminate at print. This gave the catalogue a special feel and visually stood out in this industry. We were involved in every stage of production from conception through to final print. Including, photography, art direction, planning, design, artwork and print. Call Andrew Burdett Design, the bespoke catalogue design and print experts, for a FREE appraisal and quote on 01433 208307.